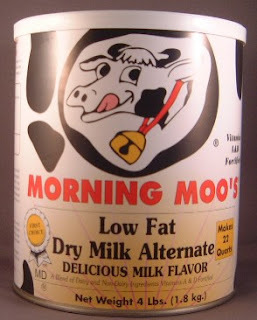 we taste-tested and the verdict is in - morning moo is (relatively) delicious. it is powdery and when chilled, can just about pass for actual milk. Q: but my family won't drink the powdered stuff. why should i store it? Mix together and store in a ziplock or airtight container for up to 3 months. Makes about 6c. mix. Mix together eggs, oil and water. Add the pancake mix and stir until blended. Gently fold in berries or other additions. Cook and enjoy! Makes about twelve 4 inch pancakes. Mix all dry ingredients together. With a pastry blender or heavy duty mixer, cut in shortening, until mixture resembles cornmeal in texture. Makes about 13 cups. Preheat oven to 350 degrees. Grease a 9 inch square pan. Mix Quick mix, cornmeal and sugar in a bowl. Combine eggs, with milk or water in another bowl. Add to dry ingredients and blend. Add melted butter and stir to blend. Pour into pan and bake 35-40 minutes or until golden brown. Makes 8-10 servings. Place all of the ingredients into the blender, including the oil and the non-stick spray. (remember your milk is non-fat and the oil is needed to make it creamy and thick, the spray emulsifies it) Use less water for thicker shakes. The blender should be ¾’s full. Place the lid on and process for a full 2 minutes. Pour into cups and serve. Makes 4 – 12oz. servings. Variations: add a banana, or a big spoonful of peanut butter, add a few broken red & white candy mints for chocolate mint. For vanilla omit cocoa and reduce sugar to ½ c. and add 1 T. vanilla. Mix all ingredients well. Store in air tight container in cool dry place. Mix 1/3c. (or 3 heaping Tbsp.) mix to 1 cup hot water. Stir the mixture every now and then. When it comes to a full rolling boil, remove from heat. Allow to cool slightly. Add 1 c. non-fat dry milk slowly, using a whisk. Stir until smooth. Makes 1 can, store in fridge for 2 weeks or freeze. Sift powdered sugar and cocoa into bowl. Add butter and milk. Do not stir. Microwave 2 minutes on high. Stir. Add vanilla, stir. Pour into 8” square baking dish. Refrigerate one hour before cutting and serving.